Most of the Participants at the 2012 FIG Commission 7 Annual Meeting FIG President CheeHai TEO joined FIG Commission 7 Delegates at its 2012 Annual Meeting in San Luis, Argentina. The annual event included a One-day International Symposium with the theme “Land Governance in South America and International Perspectives”. Tango in Uruguay... The 8th FIG Regional Conference titled "Surveying towards Sustainable Development" was held in Montevideo, Uruguay 26-29 November 2012 with more than 250 participants from all over Latin America and all other continents, altogether 33 countries. The successful Regional Conference in Uruguay proved that Latin America is a very interesting area both for the Surveying society and for hosting a conference. The local host of the Regional Conference was Asociación de Agrimensores del Uruguay (AAU) who organised the conference in cooperation with FIG. The conference was co-sponsored by UN-HABITAT, OAS, and the World Bank. The main focus both in the plenary sessions and the technical sessions were on the Latin American region and during the conference there were many professional discussion within the different areas of surveying between participants from the region and from all over the world. Very special greeting for President CheeHai TEO FIG President made another working visit to Abuja, Nigeria between 20 and 21 November 2012 as part of the lead-up to the 2013 FIG Working Week. During the visit, apart from continuing the discussion with the Nigerian Institution of Surveyors on their preparation, President CheeHai TEO delivered the 30th Annual Olumide Memorial Lecture on 20th November 2012. HKIS President, Ms Serena LAU The Hong Kong Institute of Surveyors held their annual dinner on the evening of 6 November 2012 at the Grand Ballroom of the Grand Hyatt Hong Kong. Ms Serena LAU, HKIS President welcomed members and guests to what was a grand evening. Most of the Participants at the 2012 FIG Commission 7 Annual Meeting FIG Commission 7 held its 2012 Annual Meeting in San Luis, Argentina. The annual event included a One-day International Symposium with the theme “Land Governance in South America and International Perspectives”. FIG President CheeHai TEO joined FIG commission 7 delegates. Acting Surveyor General of Brunei Darussalam, Awang Haji Ali Bakar bin Kassim The Survey Department, Ministry of Development Negara Brunei Darussalam, celebrated its 60th Anniversary with a one-day seminar. The theme of the Diamond Jubilee Celebratory Seminar was “Geospatial for Sustainable Development”. FIG President CheeHai TEO was invited and delivered the keynote at the opening segment of the Seminar. On 15 November 2012 the Economist awarded successful innovators. Jack Dangermond, president of the Environmental Systems Research Institute, ESRI received the computing and telecommunications award, together with John Hanke, vice-president of product management at Google. FIG Congratulates its Platinum Member, ESRI! Geo-matching.com is an initiative from FIG corporate member Geomares Publishing. Geo-matching is the independent product comparison website for professional hard- and software for geomatics and adjacent fields. The website leads you through the maze of specifications and gives the opportunity to compare products of different producers, read up on reviews given by users, in order to reach a balanced judgment before buying. ISO STANDARD FOR LAND ADMINISTRATION APPROVED! On1 November 2012 the 'Land Administration Domain Model (LADM)' was approved as an official International ISO Standard . This is a milestone in the development of land administration systems.The proposal for this standard was submitted by FIG to ISO almost five years ago. FIG Office visits Nigerian Institution of Surveyors FIG Working Week 2013 is not far away and the very active members of Nigerian Institution of Surveyors are working intensely to organise an exciting and successful Working Week. FIG Office visited Abuja to coordinate the preparations and also got a chance to meet the Surveyor General of the Federation and SURCON. President Teo visits The Danish National Survey and Cadaster The Danish National Survey and Cadaster, KMS has initiated an agreement that improves and links public registers of basic data and makes data available to the private sector. Once the public authorities have tidied up, merged all data and stopped parallel registration, annual savings in administration is estimated to amount to DKK 260 mio (35 Mio EUR) in 2020. Basic data includes private addresses, companies' business registration numbers, or the cadastral numbers of real properties. The Conference was supported by FIG, and held in the Hotel International in Zagreb. A wide range of topics and distinguished keynote speakers guaranteed interesting presentations. One of the presenters was Dr. Chryssy Alex. Potsiou, FIG Vice-president. Eva-Maria Unger, FIG Young Surveyors being interviewed after Opening Ceremony (image courtesy of Lilia D'Alesio) Fifty young surveyors from 17 countries participated in this year’s training course. Areas of study included topographical and geometric surveys, production of large-scale orthoimages, GNSS surveys, geodetic reference systems, RTK, photogrammetric and LIDAR surveys, geo-referencing of cadastral maps, remote sensing and structural monitoring and deformation surveys. Dr. Joan Clos, Executive Director of UN-Habitat The theme for the Forum was “the urban future”. In his opening speech, UN-Habitat Executive Director Dr. Joan Clos said the Forum provided UN-HABITAT with the perfect chance to listen to what the stakeholders had to say and that it is the responsibility of his agency to relay to governments what the participants wanted done. FIG Young Surveyors Network through Kate Fairlie and Eva-Maria Unger actively participated in the Forum. The second session of the UNCE-GGIM was convened at the United Nations Headquarters in New York UNCE-GGIM was established to be the official United Nations consultative mechanism on place, locality and geography. UNCE-GGIM plays a leading role in setting the agenda for the development of global geospatial information, while promoting its use to meet key global challenges. In his opening remarks, United Nations Under-Secretary-General for Economic and Social Affairs, Mr. HongBo WU said that understanding and analysing geospatial information has become a key driver of competition and underpins new waves of productivity growth, innovation and services. President Fausto Savoldi at the opening ceremony. President CheeHai Teo making his opening address. The FIG Working Week Knowing to manage the territory, protect the environment, evaluate the cultural heritage and the XXXV General Assembly was held in Rome, Italy from 6 to 10 May 2012. Consiglio Nazionale Geometri e Geometri Laureati, CNGeGL, was the local host of this year's Working Week. The main partner of the Working Week was FAO including a full day workshop jointly organised by FIG and FAO and a visit to FAO headquarters. A full day program was also organised together with the Global Land Tool Network, GLTN, in co-operation with UN-HABITAT and GLTN professional partners and introducing grass root organisations. CNGeGL organised a well received invited session on Professional Women in Surveying. To the Working Week were attached some special events: the 1st FIG Young Surveyors Conference; IAG/FIG Commission 5/ICG Workshop and History Workshop. The Working Week turned out to be the biggest FIG Working Week ever if counted by number of participants. More than 1,500 participants from 96 countries attended. The technical programme comprised of more than 100 technical sessions, workshops and special forums. Total number of presented papers was almost 500. In total 750 abstracts were submitted to the conference. The Working Week was held at the first class venue Rome Cavalieri hotel offering both excellent facilities and outstanding view over the eternal city. FIG Council at the General Assembly. New Vice Presidents: Bruno Razza (Italy, left) and Pengfei Chen (China) after the elections. FIG General Assembly 2012 was held during the Working Week in Rome, Italy. In total 71 different member associations were present at the two sessions of the General Assembly and in total 350 delegates attended the General Assembly sessions. The first session was attended by 66 member associations and 65 the second session out of which 58 were allowed to vote. The participants represented all membership categories as well as observers. Kate Fairlie making the welcome address. More than 120 Young Surveyors from 40 countries joined the first FIG Young Surveyors Conference held in Rome, Italy, 4-5 May 2012. The network manifests across social media, which was prominent during this event. The participants at the seminar The IAG, (International Association of Geodesy), FIG Commission 5 and ICG (International Committee on GNSS) held a technical seminar prior to the Working Week, on 4-5 May 2012 with 42 active participants. UNOOSA (United Nations Office for Outer Space Affairs) generously sponsored 4 delegates to attend this seminar. The two days included presentations and discussions. FIG Working Week 2012 "Knowing to manage the territory, protect the environment, evaluate the cultural heritage" was held in Rome 6-10 May 2012 at the Rome Cavalieri Hotel. More than 1,500 participants from 100 countries attended this main FIG conference. The conference was organised by Consiglio Nazionale Geometri e Geometri Laureati (CNGeGL) and FIG. The main partner is FAO. The keynote speakers included Alexander Mueller, Assistant-Director General of FAO. FIG organized the first Young Surveyors Conference 4-5 May in Rome allowing young professionals easy attendance to the Working Week - more than 120 participants from 40 countries accepted the invitation. FIG and IAG organized a joint technical seminar on reference frame in practice 4-5 May and a traditional history workshop was held 4 May. Rome Cavalieri in Rome waiting for FIG General Assembly. The FIG General Assembly will be held 6 and 10 May in Rome in conjunction to the FIG Working Week 2012. The main issues on the agenda will be election of two Vice Presidents (2013-2016) and election of Commission Chairs Elect (2013-2014). The General Assembly will also decide on the hosts of Working Week 2015 and Working Week 2016. The agenda is now available and the FIG Office has sent an invitation and hard copy of the agenda without appendices to all members. The FIG Annual Review 2011 is now available (32 pages, 3.66 MB) as a .pdf-file. Hard copies will be mailed to all members together with the minutes from the General Assembly in Rome. To receive your personal copy, please contact the FIG office, email: FIG@fig.net. The FIG Foundation will be providing research grants of up to 20,000 euros spread over two years. Applicants should be based in a surveying/geomatics academic or research programme in a country listed by the World Bank as a low-income, lower-middle or upper-middle income economy, have an established record of published research - at least two articles in good quality internationally recognised peer reviewed journals serves as a useful guideline, and have experience in managing postgraduate students. The FIG General Assembly will elect two new Vice Presidents at its meeting in Rome, Italy 6-10 May 2012 for term of office 2013-2016. The General Assembly will also elect a Chair Elect to each of the 10 Commissions for term of office 2013-2014. The appointed Chair Elect will normally be elected as the Chair of the Commission at the FIG Congress 2014 for the period 2015-2018. Closing date for nominations has passed 2 January 2012. Many countries experience that young people have a lack of knowledge in the field of Surveying and Geodesy and face a decrease in the number of student. A German initiative by DVW has resulted in a web site which is now also published in English. 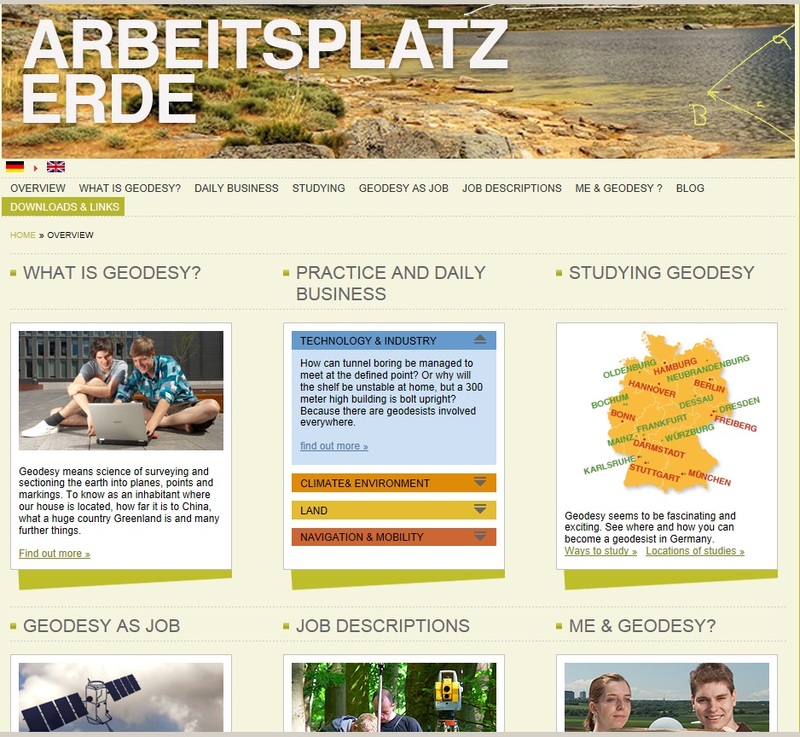 The web site gives a broad overview about Geodesy and its diverse disciplines. Furthermore it provides rich information regarding the study courses (focused on Germany). Have a look at the web site and be inspired how you could also promote the profession in your country. Mr. Marius Arthur URSU has been apppinted new general director at the National Agency for Cadastre and Land Registration (ANCPI). The Voluntary Guidelines on the Governance of Tenure were endorsed by the 38th (Special) Session of the Committee on World Food Security (CFS). Noted that, according to their title, the Guidelines are voluntary and are not legally binding. Requested FAO to ensure that the Guidelines are included as a priority in the new Strategic Framework that FAO is developing and in relevant work programmes. The Bureau of Land Management, USA, who is Affiliate member of FIG commemorated 200 years of the General Land Office, its predecessor, on 25th April 2012. The General Land Office was first established on April 25, 1812. The commemoration was held at BLM's Eastern States Office outside Washington DC. FIG was represented by Chair of FIG Foundation John Hohol and FIG President CheeHai Teo together with BLM's Chief Cadastral Surveyor, Don Buhler.